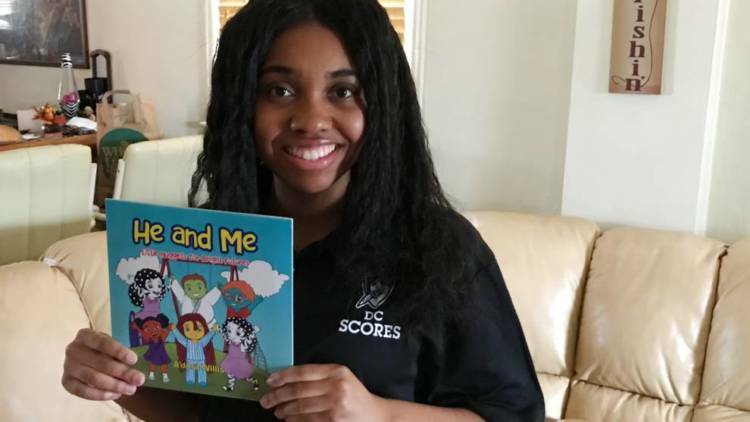 At 19 years old, A’dora Willis of Greenbelt, Maryland, just published her first children’s book. She is a full-time student at Bowie State University, helps her mother run a home daycare, volunteers with the youth organization D.C. SCORES and teaches kids at a martial-arts studio. Yet Willis wanted to do more to help children. Willis began writing in third grade as part of D.C. SCORES, a nonprofit after-school program for kids in need that combines writing, soccer and service-learning. Soccer is what first drew Willis to the organization, but the required weekly writing workshops helped her realize her passion for poetry. The book, “He and Me: Little Nuggets for Bright Futures,” was inspired by the children who surround Willis daily, including her two little sisters. She originally wanted to create a children’s cartoon for television, but her mother advised writing a book first. Willis hopes this, and her future books, will someday be developed into an animated series. The vibrant illustrations she designed with her mother depict children of all colors and with a multitude of features and backgrounds. The characters, ranging from pink to brown, have glasses, gaps between teeth — inspired by her mother’s own gap — freckles, dreadlocks, afro puffs and even polka-dotted hair. As a D.C. SCORES alumna, Willis tries to provide the same support and care to current participants that she received when she was young. Willis stopped writing in sixth grade because her middle school did not have a D.C. SCORES program and she didn’t know any other kids that wrote poetry. She said she doesn’t want the stress that school, problems at home or bullying can bring to lead other kids to stop pursuing their passions. She hopes her book can provide comfort to kids who are struggling. Katrina Owens, chief of staff at D.C. SCORES, praised Willis’s leadership and growth from a student in the organization to an accomplished alumna. Willis is grateful for the continued support of D.C. SCORES and described the organization as a part of her family. The praise and gratitude Willis is receiving from readers of “He and Me” has motivated her to write more books. She aims to spread messages of positivity to readers of all ages and to encourage young readers to keep doing what they love, regardless of external pressure, stress and worry.